Although the price of interactive whiteboards has fallen sharply, they still represent a substantial outlay for most schools. There are ways for schools to increase value for money and make sure the potential of this fairly new technology is not wasted. There has been a dramatic increase in the number of interactive whiteboards in schools, particularly since the government's two-year funding boost. However, for many teachers, interactive lessons are still something they struggle with. What is undoubtedly true is that once schools acquire one or two interactive whiteboards they usually are asked for many more. 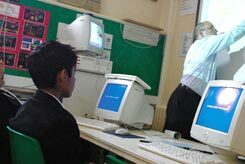 The first benefit of a data projector, with an ordinary or interactive whiteboard, is that lessons on the teacher's computer - whether stand-alone or connected to the network - are projected to the whole class with ease. This saves on worksheets, which is great for both teachers and students. Sharing resources across a department is also much easier if they can be 'called up' in the classroom via the school network. Really effective departments share resources anyway, but this technology makes it easier. Once shared and saved, materials can be easily and quickly adapted for different teachers and classes; they can also be updated in future years without having to make major overhauls. Another benefit is that students are more actively engaged in lessons. Apart from anything, it is easier to see if they are paying attention when they are looking at the board. A good presentation is potentially more legible than many worksheets. The great benefit of interactive whiteboards is, of course, that they allow for more active participation in lessons and for more open-ended work. It would appear that when most teachers get a new whiteboard system, they first use it almost exclusively to project data, usually presentations. As they develop more confidence and expertise they go on to make use of the system's interactivity. Senior leaders need to allow some time for this to happen, in much the same way that most people 'play' with a computer before they start to use its potential. Once they make the step, this two-stage process should not be seen as a problem. The better companies have realised that staff training and software that uses its system's interactivity are both key to schools getting maximum benefit from the technology - and buying more systems as a result. Staff training is absolutely vital. As already indicated, teachers are inclined to use the system for presentations first to get used to the technology. Thus, the initial training can be done by existing school staff. This should encompass not much more than showing how to switch the system on and off, followed by some simple ways in which they can use the software. This may take a few weeks to achieve. After this initial stage, there is a need for specific subject training. This is where the trainers provided by the supplier should be used. It is time intensive but one of the lessons shown by the lottery-funded ICT training for teachers was that subject-based training is more effective educationally. It is much better if the trainers (whose time should be costed into the purchase price) are talking to teachers who have had a bit of time to become familiar with the basics, otherwise the time will be wasted. Good software that makes the system work interactively is the second vital element in the process. There are many gimmicks out there and, just as with books, some software is better than others. Teachers should be encouraged to read reviews and swap ideas with other specialists. Good software has to result in improvements in student learning. By Jim Donnelly, head of Litherland High School, Sefton, Merseyside. He is currently seconded on a part-time basis to the LEA. Start with the enthusiasts in your school. Consider furnishing a whole department early in the process in order to demonstrate the benefits of sharing. Accept that it will take time for staff to move from data projection to interactive lessons. Consider putting a non-interactive data projector in the school hall, with a large screen. Get together with other schools to get a better deal. Offer to act as a demonstration centre in return for hardware and software, as many suppliers are still trying to increase market share.